Introduction. Managing and allocating water resources: Adopting the integrated water resource management approach (S.J. Toope, K. Rainwater, T. Allan). Water Resources Management and Policy. Integrated water resources management is more a political than a technical challenge (J.A. Allan). Scenarios as a tool in water management: Considerations of scale and application (C. Warwick, K.B. Bakker et al.). Water sustainability: Science or science fiction? Perspective from one scientist (W.W. Wood). Improving irrigation efficiency through technology adoption: When will it conserve water? (N.K. Whittlesey). Lessons learnt from the impact of the neglected role of groundwater in Spain's water policy (R. Llamas). Hydrologic sciences and water resources management issues in a changing world (S. Sorooshian, B. Imam et al.). Arid and Semi-arid Regional Water Resources Management and Policy. The Nile Basin regime: A role for law? (J. Brunnée, S.J. Toope). Biosphere reserves on north-western Egyptian coast, a site for monitoring biodiversity and integrated water management (B. Salem). Contribution of UNESCO-international hydrological program to water resources management in the Arabian Gulf countries (A. Salih). Salinity management for the landscapes and rivers: The Murray-Darling Basin in Australia (R.J. Newman). Alternative water policies for the Gulf cooperation council countries (W.K. Al-Zubari). Reallocation of water and the hydrological effects of climate change: The Upper Rio Grande Basin, southwestern USA (M.E. Campana, L. Scuderi et al.). Water management in the Arabian Gulf Region and a partial solution to water shortages (A.E.M. Nairn). Impact of political, scientific and non-technical issues on regional groundwater modeling: Case study from Texas, USA (K. Rainwater, J. Stovall et al.). Sustainable development and management of water resources in the Arab region (J. Khouri). Water management strategies in the Arabian Gulf countries (M. Al-Senafy, K. Al-Fahad, K. Hadi). The environmental impact of groundwater exploitation in African grasslands: Examples and a case study from the Kalahari region (D.S.G. Thomas). From vision to action: Towards a national policy for integrated water management in Sudan (O.M.M. Ali). Water resources in the United Arab Emirates (Z.S. Rizk, A.S. Alsharhan). Science and Engineering Advances in Support of Water Resources Management. Renewable and non-renewable groundwater in semi-arid and arid regions (M. Edmunds). Groundwater recharge estimates in arid areas using channel morphology and a simulation model (W.R. Osterkamp, L.J. Lane). Enhanced salinization (A.S. Goudie). Timing of recharge, and the origin, evolution, and distribution of solutes in a hyperarid aquifer system (W.W. Wood, Z.S. Rizk, A.S. Alsharhan). Fully-integrated modeling of surface and subsurface water flow and solute transport: Model overview and application (E.A. Sudicky, J.E. Vanderkwaak et al.). From drainage to recharge to discharge: Some time lags in subsurface hydrology (P.G. Cook, I.D. Jolly et al.). Environmental tracers applied to quantifying causes of salinity in arid-region rivers: Results from the Rio Grande Basin, southwestern USA (F.M. Phillips, S. Mills et al.). Climate outlooks for water management adaptation to climate change in the Middle East (R. Washington, M. Swann). Lenses, plumes and wedges in the Sultanate of Oman: A challenge for groundwater management (P.G. Macumber). Later quaternary paleorecharge events in the Arabian Peninsula (S. Stokes, H. Bray et al.). Dating of holocene groundwater recharge in western part of Abu Dhabi (United Arab Emirates). Constraints on global climate-change models (W.W. Wood, J.L. Imes). Many countries in the world have made great efforts, to remedy the water shortage, by providing financial and technical backing, for water desalination, treatment of wastewater and improved management and conservation techniques. Water ministries, universities and research centres have supported scientific research, and applied the most recent technologies, in search of new and alternative water supplies. Laws have been promulgated, economic and public relation campaigns developed, to promote and encourage the practice of efficient water use and the conservation of this scarce commodity. 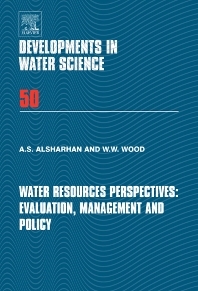 This book covers water resources and management and provides a new vision of water resources management, water conservation and legislations, water law, and modern techniques of water resources investigation.